?Your prayers will be heard, the moment you start believing?, Ga&euml;tan Vandewoude from Leuven can be heard singing prophetically on the self-titled debut album of Isbells. And guess what? That's exactly what happened to him. In his native Belgium he had been trying his luck in various bands for fifteen odd years. He was a drummer with bluesrock combo Ellroy and a guitarist with emocore outfit Soon. But with his thirtieth birthday steadily approaching, Vandewoude felt the urge to go for something a little closer to his heart. He impulsively quit his day job and retreated to the countryside. He installed a studio in a decrepit stable next near his house and spent most of his nights experimenting there, eventually recording his songs one by one. The result of this labour of love is a series of wistful, introspective numbers inspired by his relatively isolated surroundings and the small events marking his daily life. Sometimes Vandewoude writes about relationship frictions or being confronted with his own shortcomings, and other times about his daydreams or the kind of world his four year old daughter will grow up in. His songs tend to be personal observations, yet they are never preachy. ?We all go through unpleasant experiences in our lives?, the artist explains. ?But there's always hope. To me it's important to keep following your dream and stay positive, no matter what.? The folky little gems that made their way to Isbells' album were all centered around Vandewoude's quiet, understated voice and acoustic guitar. This was a big step, as he had never sung on a record before and was still discovering his vocal abilities. At a later stage he would draft in some like-minded souls to add delicate harmonies and some extra instrumental flourishes: a touch of brass to ?As Long as it Takes' and ?My Apologies', a little banjo and percussion to ?Without a Doubt', some electric guitar to ?Maybe' and haunting vibraphone to ?I'm Coming Home'. Ga&euml;tan Vandewoude's ?less is more' ethic worked remarkably well, so his collection of sparsely arranged but carefully crafted songs manifested as an album released in late October 2009 under the Isbells moniker. The singer wanted the album sleeve to look like a vintage postcard so the striking image of an early twentieth century water-carrier in Constantinople fit perfectly with the timelessness of the music. The cd, which came out in Benelux on a small indie label called Zealrecords, caught many by surprise. Right away it got rave reviews in all major publications in Belgium and the Netherlands. Within weeks Isbells stormed the local charts. The single ?As Long as it Takes' received airplay from every conceivable radio station and scratched the top-twenty, the album peaked at number 18. Six months later the cd remains a steady seller. As media interest in Isbells grew, Ga&euml;tan Vandewoude turned his solo project into a full-fledged band. Taking Na?ma Joris, Bart Borremans and Gianni Marzo on board finally enabled him to perform his songs live. As a foursome Isbells got their feet wet in small clubs supporting the likes of Mark Eitzel, Local Natives and Emily Jane White. A last minute invitation to EuroSonic, a major showcase festival in the Dutch university town of Groningen in January 2010, led to a gig that went down exceptionally well with all who were lucky enough to be there. The De Spieghel upstairs venue was crammed, while a huge crowd waiting outside vainly tried to make their way in. That same month Isbells shared the bill with The Low Anthem at a sold out Ancienne Belgique in Brussels, rendering an audience of 2000 utterly speechless. Since then, the band has invaded nearly every stage worth mentioning in Belgium and Holland, a ?tour de force' which culminated in a spell-binding gig at Amsterdam's Paradiso in May. Having conquered the low countries overnight with their brooding and intimate music, Isbells started to explore other territories, supporting Megafaun in Berlin, Munich and Paris. Eventually a deal was inked with the Coda booking agency in London, which was seduced by Isbells' purity and dedication. Coda will represent the band for the whole of Europe. The first responses in Britain to Isbells' eponymous album have been very promising. London's famous Rough Trade Shop gave it their blessing and made it their album of the week. Isbells were also lauded by Sheffield-based broadcaster Trevor Thomas and BBC Radio One DJ's Rob Da Bank and Zane Lowe. Needless to say expectations are high for the quartet which successfully played The Great Escape in Brighton last May and will appear at Summer Sundae in Leicester next August. So yes, the future looks bright for a band with the potential to floor both fans of Bon Iver and Simon & Garfunkel. Listening to Isbells' debut means revelling in the presence of soft-spoken greatness. Just call it late night music for early risers. And play it again. And again. And again. ?Tell all your friends this Belgian band is unbelievable! So good they are hard to discribe. (...) Big things are coming to you guys. You deserve it!? 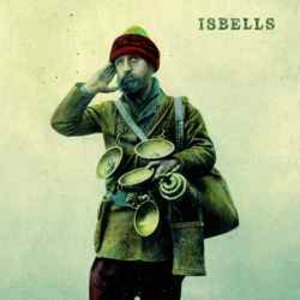 ZANE LOWE (radio Dj at BBC 1): ?if You like Fleet Foxes and Bon Iver, you will flip out over Isbells?. ROB DA BANK (radio Dj at BBC 1): "Thanks also to nigel at rough trade for introducing me to the isbells record-bon ivers long lost european cousin...ace :)"